Published on 08/06/2011 in La Strada, fotografie, scriituri senzatii impresii and travel. 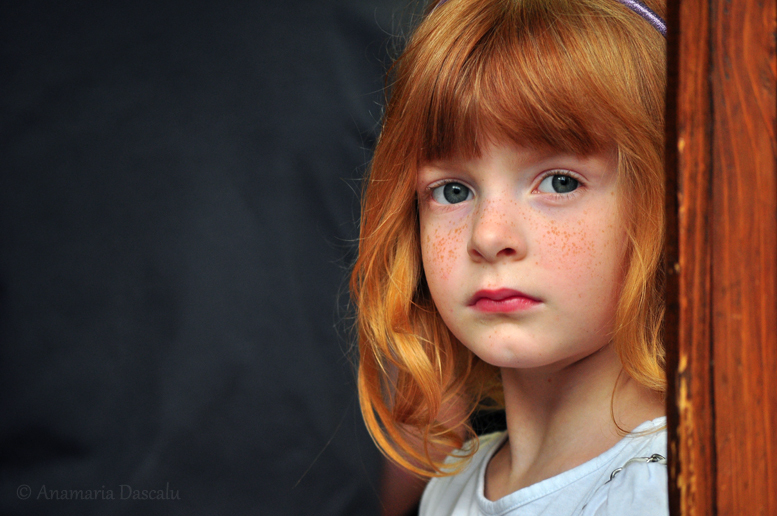 7 Comments Tags: 55-200mm, fetita, fotografie, freckles, ginger, nikon, par, pasiune, pistrui, portret, pretty girl, roscat, sibiu. The fermenting crowd was making it difficult to focus on just one individual, colours of all sizes merging into one compact hoard. In all that rainbow mush, a white ball of fluffy-dog-madness caught my eye, but my attention soon switched to the little girl standing numbly next to it. I rushed to the viewfinder to take one shot before the door hid her away completely. Quickly zoomed in and framed the photo, just as her brother was turning away, his t-shirt granting me the dusty background to match her pixie eyes and cover the souvenir clutter. The light was perfect and her colours were magic. I usually take a few extra shots because I feel I could do it differently; this time, one was all I needed, anything extra would have lessened its relevance. It all happened so fast it overwhelmed me. I immediately left the scene, with an almost guilty feeling of having stolen something. This here is the reason I take photos, that moment in which the Photography Gods put everything in order to create one frame for you to find. And the best part is chasing that fleeting frame.